K3ep going all n1te just like all that sp4m c0ming in through your mailbox. 10 watts, it's a new record! From joke to revolver as we say, I’ve noted that many of you find hacking away from power sources quite useful. Here’s how to keep at it longer with low power. What is killing my battery? First off, STOP what you’re doing and realize that every single IO op and every second of CPU time is killing your battery. The more you can do without hitting disk, the better – more about disk access later. 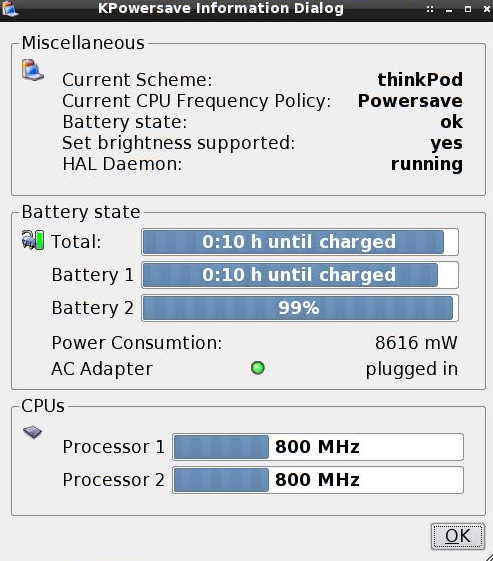 Use gnome-power-manager’s Power History or powertop to measure your progress towards the Ultimate Battery Life, as measured in watts consumed. You should note the wattage on battery before you start fiddling with settings, and note the impact of every change – in watts and minutes gained – as you make them. I started out with a power consumption of about 42W and managed to shave it down to 10W in special circumstances. Beat that and tell me about it! Once you’ve followed the tips below you’ll be able to enjoy as much computer time as your battery can possibly produce! Clamp your clock … or not? Clamp your CPU down to the minimum possible. 800MHz is plenty, more than you need. Really. You may think that a dynamic clock will get things done faster, but alas you will use more watts total than if you had sticked to the low cpu speed and taken your time. Realize that CPU frequency switching itself costs battery power! You can save up to *10W* by clamping your CPU clock! [edit 2009-09-24]: According to mjg59 it’s better to make your cpu clock ondemand so that it can get the work done and go back to idling. This is counter to intuition and my experiences, but the math is sound if the processor does go back into idle fast enough. So, try ondemand and see how it compares to clamping. 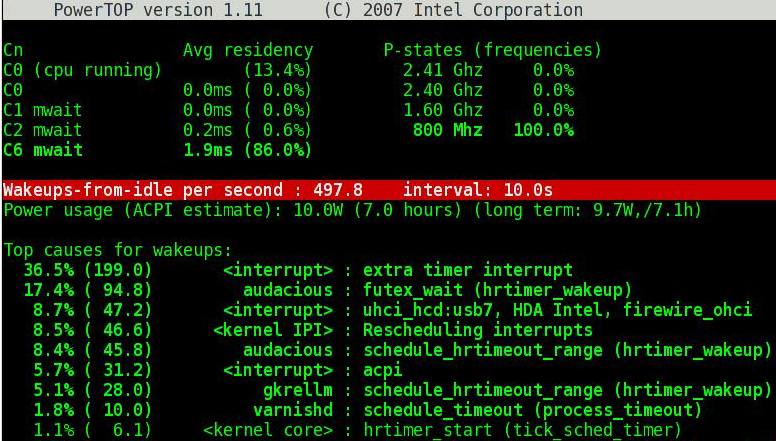 On newer laptops, where cpu frequency switching takes less time, ondemand may be a better power saver. gnome-power-manager and kpowersave are nice apps for adjusting the behaviour of your system on battery. However, power-manager doesn’t let you tweak clock speed, and neither app is enough to get the most out of your battery. Now, grab Intel’s powertop through apt or yum or whatever godforsaken package manager you are using. Run powertop as root and follow all of its suggestions, which include setting USB autosuspend, SATA link level management and some rather nice sysctl settings. 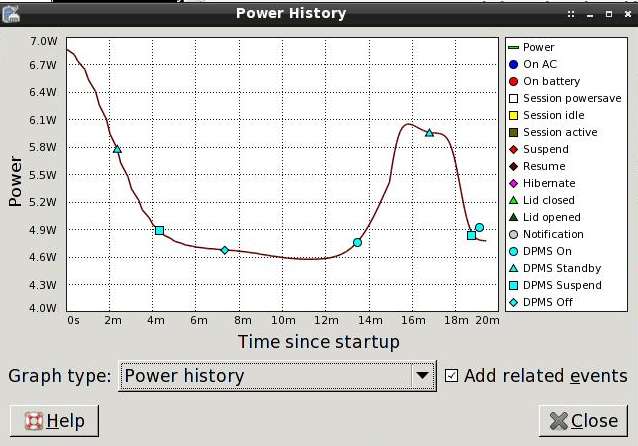 Powertop shows a respectable 13W power drain. You can gain 6-8W by following powertop’s tips. That might translate to another half hour or more! Thus reading a file will not cause the writing to its access time bits, which is faster and saves power. If you’re a weirdo you should also look at relatime and nodiratime. # Aye, this be a laptop. Flush dirties after IO. If it says “userspace”, either HAL, gnome or kpowersave is what you need to tweak. They need to be executed as root. Just because you disabled the cpu core doesn’t mean your system is using less power. Mine will use about 1.3W *more* if I disable the sec0nd core. YMMV. I’d love to hear about your experience. Every brightness level on your display costs you (at least) 1 Watt of power, or maybe 15 minutes more hacking! Set your panel brightness to the lowest level you can go while still being able to read text. Use gnome-power-manager or kpowersave to dim the backlight or even turn off the screen after 2 minutes of idleness. If you’re not using the nets, disconnect and turn off the radio with your KILL switch. If you need to stay connected and you’re on your own wifi, there are things you can tweak in your access point to save battery. Go to your wireless settings and increase the DTIM interval (try doubling or tripling the default) and set your beacon interval to once every few seconds. What it saves in CPU power it costs in latency. Every single running application, every single background daemon and every active driver takes a continuous charge off your battery and eventually depletes it. So turn off everything but what you are working with right now. Remove beagle and updatedb to avoid those nasty cron jobs scanning your whole system. Firefox is a particular power hog, especially with flash and java plugins running. Kill it, use opera or chromium instead. Use only a few tabs and close them when you are done! Go through the scripts in /etc/rc3.d (or chkconfig –) and disable all the services you might as well start manually when you need them. Create a short script that stops all non-essential services, one by one. let &guicursor = &guicursor . ",a:blinkon0"
I mentioned that I’ve managed to trim down to a total power usage of 8.1W – this translates into 14 hours of mp3 play time with a 9 cell + 3 cell expansion battery when my laptop is in “heavy iPod mode” – lights out, lid closed, display off and only audacious2 piping some of the breakest beats and dubbest steps into my headphones straight out of my backpack. lesswatts.org is a cool place to continue from here. Who’s to say these tips only apply to laptops? Recently companies have been looking for ways to save the environment – and save money on their electricity bills. Easy peasy with these steps. This entry was posted on Monday, September 14th, 2009 at 4:10 pm and is filed under cli, debian, howto, linux. You can follow any responses to this entry through the RSS 2.0 feed. You can skip to the end and leave a response. Pinging is currently not allowed. Nice one, finally had a chance to tickle with this. I found the “laptop_mode” / laptop-mode script quite useful, which essentially does most of the kernel/disk stuff for you. On my Ubuntu it was installed but disabled by default. I found that kjournald would keep waking up the disk even with noatime, which I suspect was caused by relatime, but was also solved with the laptop-mode script. An other annoyance is logs. I decided to just use a ramfs. Since this is a laptop, I don’t really need old logs, but I often use logs for debugging. This helped alot, since stupid things like wicd insisted on waking up writing a log-entry every few seconds. I’ve found the same about mac PC. There is a certain procedure to follow to get maximum from the battery using mac os. I’ll post it soon here after some testing. Awesome. You can Google in black on your phone at http://bGoog.com to extend you battery life and to use less bandwidth! The black background definitely saves power on my phone and it looks sweet too.